Victorian house on fire in Oakland. 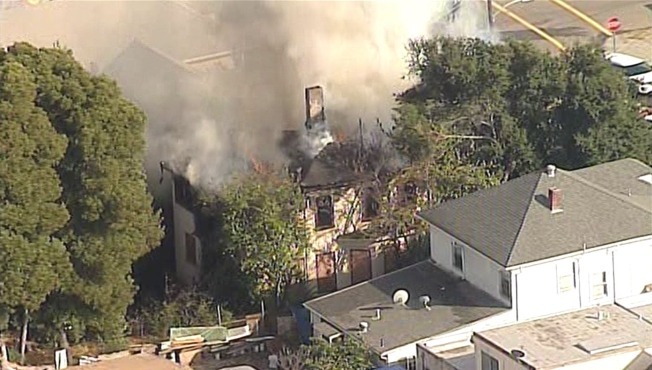 A single-alarm fire on Thursday gutted a vacant Victorian house in Oakland. Flames broke out on the 1700 block of E. 19th Street around 5:05 p.m., Oakland fire Battalion Chief Melinda Drayton said. The two-and-a-half story home is located near San Antonio Park. Drayton said firefighters took a “defensive” stance, but the structure will be a complete loss. NBC Bay Area's SkyRanger spotted heavy smoke billowing from the structure. Heavy fire was reportedly coming from the building's second floor and flames had caused the building's front stairs to collapse, according to fire officials. Crews are also protecting surrounding properties. So far, flames are not threatening any of then, Drayton said.